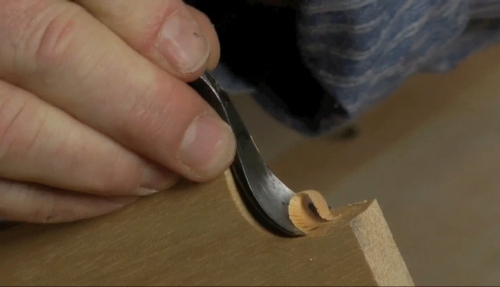 The V or 'Parting' tool is one that sits ever-ready on the carving bench extremely useful in a variety of situations. With a variety of angles and functions, it's an important to understand what it can do and how to use it. You've a problem sharpening your V tool? 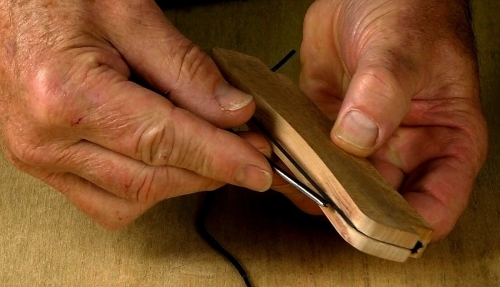 Click here or look in the 'Sharpening' category of the library for a complete step-by-step guide to sharpening your V.
Ann - The V tool is essentially 2 carving tools - chisels - joined together. 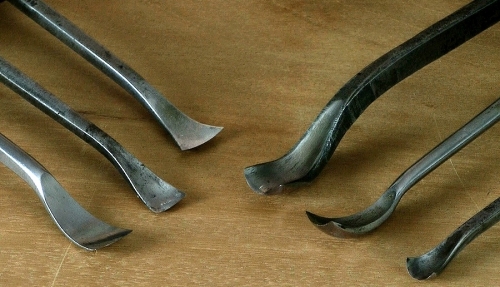 The V part is a sharp junction and might be thought of as the third carving tool. 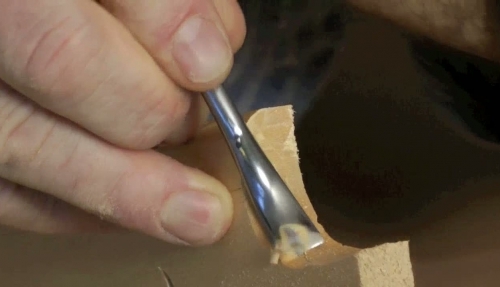 If all these tools are correctly sharpened then you will cut through the wood as you might if you could separate them. 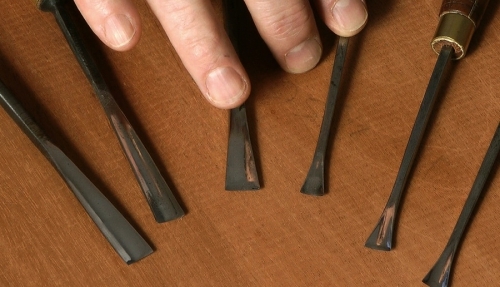 So, if you can cut across your particular wood cleanly with something equivalent to a chisel, say a deepish gouge, then it's not the wood. The issue is with the V tool itself. The chances are the cutting edge is damaged. 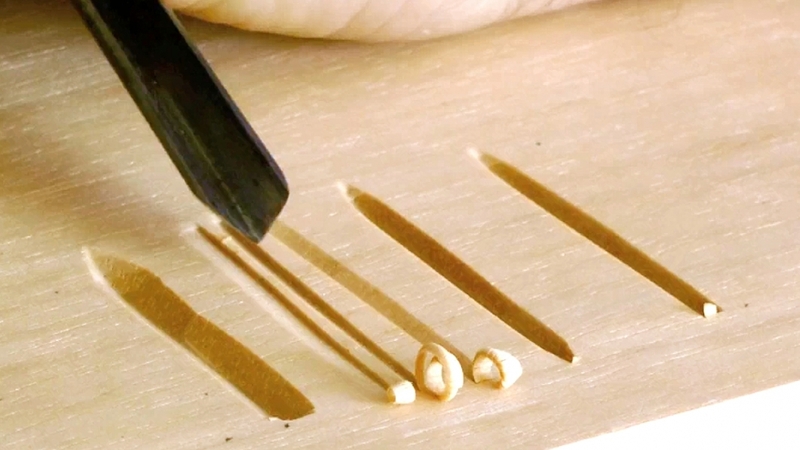 Make your cut, back out and have a look where the grain is torn or not cut cleanly and look for spots of light on the cutting edge. My guess is that you'll find some and it's these dull spots that tear the wood fibres. Touch them up with slip or benchstone. 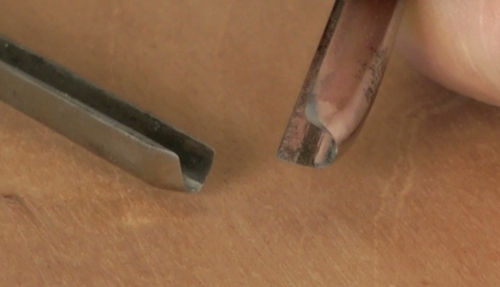 When you cut with the grain, torn grain often doesn't show up as the follow through of the bevel and heel lays it back down to some extent. Across the grain is always a good test of sharpness. Chris, I'm having problems (or have gotten myself blocked into a "corner") where I find none of my v-tools (as I'm using them are giving me a clean cut across grain, but only along the grain... What am I doing wrong?! Nicely explained.. The V tool is a fundamental tool for our style of relief carving.. from the 60 degree workhorse to the 90 degree surface pattern..